Year 7 pupils are buzzing about their free books! Holy Cross have taken part in the Bookbuzz scheme again this year much to the delight of our Year 7 pupils. 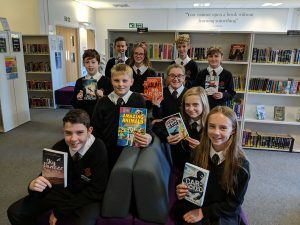 All pupils had to do was choose a book from a generous selection of popular titles….and school bought it for them! The Bookbuzz reading scheme supports the Accelerated Reader Programme that KS3 pupils take part in. Once pupils have read their books, they will be able to take an online quiz through Accelerated Reader, which will help them make progress towards reading targets as well as boosting literacy skills. We are encouraging pupils to read, take the book quiz and then swap their book with a friend.